Memorial Day should be a paid holiday for all Microsoft temps. In a press release to be distributed to the media, Temporary Workers of America asks Microsoft to clarify its new paid leave requirement for supplier's employees and to speed up its implementation. Temporary Workers of America (TWA) is a newly created union (September 2014) that represents people working full time for Microsoft's app certification lab via a contractor, Lionbridge Technologies. The union was formed because Lionbridge Technologies refused and still refuses to provide any paid leave to employees classified as temporary despite the fact they have been working full time for years. There are 40 of us in the lab and at last count Microsoft had about 40.000 'temps' working via vendors. How many still don't get any paid leave? Memorial Day is a paid holiday for Microsoft's 'direct' employees who enjoy eight such paid holidays, plus two paid 'personal days' and fifteen days of paid vacation. Lionbridge employees working alongside Microsoft's employees get nothing. On March 26, Brad Smith announced a new Microsoft requirement for its suppliers: they would have to provide at least 15 days of paid leave. The announcement does not specify what suppliers should do about the 'public holidays'. Some, like WIPRO do like Microsoft: they offer paid legal holidays AND 15 days of paid leave. TWA asks Microsoft to clarify their requirement and require its suppliers to offer the same number of paid public holidays as Microsoft AND 15 days of paid leave. Microsoft mentioned the implementation of the new requirement would take place within the next nine months. As of today, two months after this announcement, Lionbridge technologies still refuses to provide any paid leave. On April 16, Microsoft's CEO, Satya Nadella has been invited to the White House and celebrated as a 'champion of change' but nothing has changed for the 'temporary' workers who have worked for years for Microsoft without any paid leave and continue to do so. We can see no reason for Microsoft not to implement the new requirement right away. Lionbridge Technologies constantly announces record profits but refuses to its employees working for Microsoft the most basic benefits while its competitors (like WIPRO) show it can be done without problem. Why does Microsoft exempt companies like Lionbridge Technologies from implementing right now the new paid leave requirement? This coming Memorial Day, Microsoft's 'direct' employees will enjoy a paid holiday. Lionbridge Technologies employees have been offered (with Microsoft's approval) the possibility to work on Memorial Day at the usual hourly rate (starting at $17), not even overtime. Therefore, people living from pay check to pay check will "choose" to work on Memorial Day instead of being on paid holiday with their family and friends. Facebook's COO Sheryl Sandberg announced on May 12 that Facebook had started to implement its new paid leave requirement: Microsoft can do the same. Facebook also offers $4000 to supplier's employees if they don't have paid maternity/paternity leave. TWA thinks Microsoft should emulate that initiative: that would greatly help the two families who had a child in November and the one expecting a baby for the end of this month. As things are now, those families did not get one day of paid leave. The expecting dad prays the baby is born during a week-end. For some of us this will be the 4th unpaid Memorial Day since starting working for Microsoft. 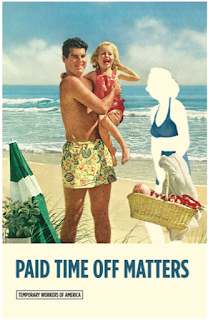 Microsoft proclaimed 'Paid Time Off Matters": it's time to walk the talk, it's time for the 'change champion' to deliver real change, now. PS: How much does providing Memorial Day as a paid holiday cost? Considering the present compensation rate of the 40 Tier1 tester/reviewers working for Microsoft and paid via Lionbridge Technologies we estimate the cost of providing Memorial Day as a paid holiday is $5204. In comparison, Lionbridge CEO, Rory Cowan made last year between $1.522.275 and $2.89 million (that's including part of his stock options): taking into account his $1.5 million compensation, one paid leave day for the 40 employees represents less than one day of Cowan's income and less than four hours when choosing his $2.9 million income. For the first quarter of 2015, Lionbridge posted record earnings and bought back 2 54.000 shares of its common stock for $1.4 million. A look in the archives: this article in The Stranger from February 1999 about Temp Rights at Microsoft. Considering the present compensation rate of the 37 or so Tier1 tester/reviewers working for Microsoft and paid via Lionbridge Technologies we estimate the cost for one paid leave day is $5204. In comparison, Lionbridge CEO, Rory Cowan made last year between $1.522.275 and $2.89 million (that's including part of his stock options): taking into account his $1.5 million compensation, one paid leave day for the 37 employees represents less than one day of Cowan's income and less than 4 hours when choosing his $2.9 million income. For the first quarter of 2015, Lionbridge posted record earnings and bought back 254.000 shares of its common stock for $1.4 million. In the Sunday edition of the Seattle Times. Cornish College art students help with Microsoft temps’ campaign for better benefits. The labor movement has a rich history of using art to galvanize support, from the black-cat symbol of the Industrial Workers of the World to folk songs by Pete Seeger and the writings of Upton Sinclair. 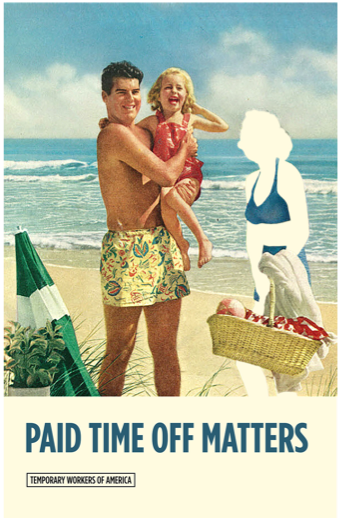 So when Philippe Boucher, a contractor on Microsoft’s campus who helped organized Washington’s newest union of technology workers, searched the Web for images to depict his campaign for paid time off, he was surprised by what he found. A partnership was born. Ilyin asked her students to create poster- and advertisement-style images on behalf of the Temporary Workers of America, the union chartered last year by Boucher and fellow employees of a Redmond unit of technology contractor Lionbridge Technologies. Among the results: A family at a barbecue with the father figure cut out. A man and a child seated at the dinner table next to an empty chair. Someone in a cast worrying about having to rush back to work too soon. That isn’t a coincidence. In March, several months after Boucher’s campaign began and amid a broader push for better wages and benefits for the lowest-paid workers in a booming technology industry, Microsoft ordered the contractors it buys services from to give their employees 15 days of paid leave a year. Boucher agrees. He’s also keeping an eye out for an opportunity to hold an exhibition of the images. We just created with Coworker.org' support an on line petition titled "MICROSOFT: Give Memorial Day as paid leave holiday to your supplier's employees." 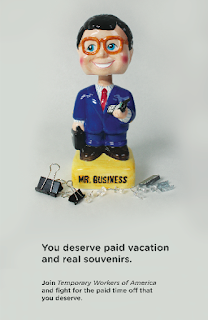 Thousands of people have worked for years for Microsoft via contractors-vendors, without having any paid time off. We think Microsoft's new policy of requiring their suppliers to provide paid time off should be fully implemented as soon as possible. 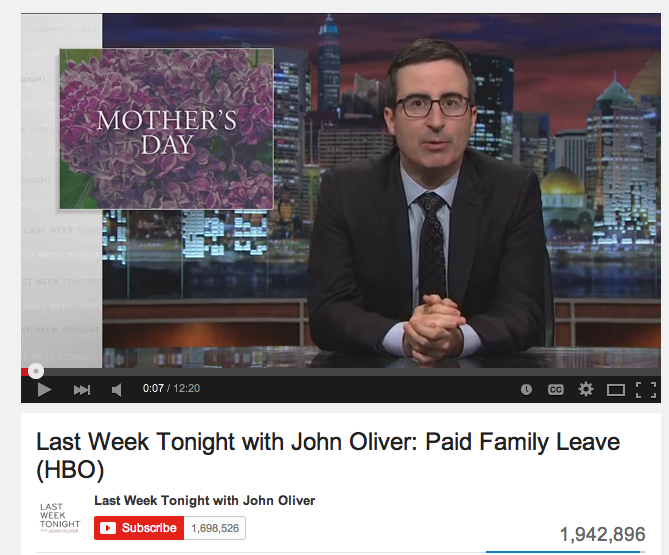 Memorial Day seems a perfect and very symbolic date to start providing paid leave. We don't see any technical or financial obstacle to do so and it would be a tangible sign that Microsoft takes its commitment seriously and will implement it promptly. This upcoming Memorial Day is an opportunity to ask Microsoft to start implementing its commitment to paid leave now instead of we don't know when. We think it's worth giving it a try. After you've signed the petition, please take a moment to share it with others. It's easy – all you need to do is forward this message. April 16: CEO Satya Nadella invited at the White House as a 'champion of change'. Sheryl Sandberg, Facebook's CEO posted this announcement (below) on FB's blog. You'll notice the similarity with Microsoft's announcement also via the company's blog and with a very similar wording. A few differences still: the $15 minimal wage and $4000 for workers who don't receive parental leave. It's not clear if the minimum 15 days of paid time off includes the 'legal holidays' or if they are added to this package. I wonder if the media compared those benefits to those offered by Facebook to their 'direct' employees. No mention of the eventual 'cost', nor who will pay for it, nor how many people are concerned. Implementation was effective May 1st for some contractors. Today, I am pleased to announce that we are implementing a new set of standards on benefits for contractors and vendors who support Facebook in the US and do a substantial amount of work with us. These benefits include a $15 minimum wage, minimum 15 paid days off for holidays, sick time and vacation, and for those workers who don’t receive paid parental leave, a $4,000 new child benefit for new parents. This will give both women and men the flexibility to take paid parental leave, an important step for stronger families and healthier children. We’ve been working on these changes for some months and had originally planned to announce this last Monday. Effective May 1, we’ve already put these standards in place for some of our largest support teams at our Menlo Park headquarters. We will be working to implement this program with a broader set of vendors within the year. This broader group will include workers who do substantial work for Facebook and who are employed by companies based in the US with more than 25 employees supporting Facebook. Taking these steps is the right thing to do for our business and our community. Women, because they comprise about two-thirds of minimum wage workers nationally, are particularly affected by wage adjustments. Research also shows that providing adequate benefits contributes to a happier and ultimately more productive workforce. We are committed to providing a safe, fair work environment to everyone who helps Facebook connect the world. This is an important step forward in this work for us. Almost 2 million people have already watched it on YT. HERE.